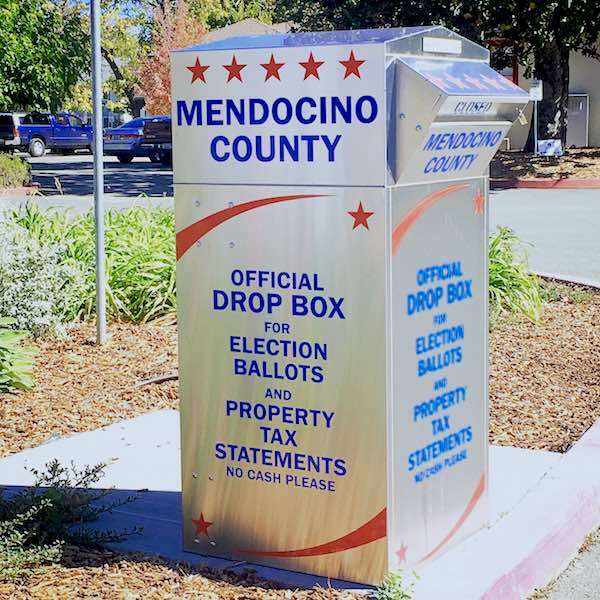 Drop off your mail-in ballot in this traffic circle box at 501 Low Gap Road in Ukiah or at any polling location around the county. UKIAH, 11/8/18 -- The votes have all been cast, but there's still a lot of counting to do in the Mendocino County Elections Office. As of about 4:45 pm. today, there remain 16,730 absentee ballots, 1,011 provisional ballots and 268 conditional ballots, for a total of around 18,009 ballots left to be tallied. So far, only absentee ballots and ballots cast at the polls have actually been tallied, amounting to 15,819 ballots. That means that on 46.8% of ballots have actually been tallied -- and that certain close races in Mendocino Co. could still flip. Ballots sent through the mail have until tomorrow, Friday, to arrive at the county's elections office -- meaning at a handful, or couple dozen might arrive tomorrow. Because of the large percentage of ballots that remain to be counted, it's technically mathematically possible that most of the races could flip from the current front-runner. However, this is, in actuality, extremely unlikely. Because the votes that have been counted so far are early absentee ballots and ballots directly filled out and cast at the polls, the counted-ballots represent a pretty good cross-section of Mendocino County voters, and it's not expected that the remaining ballots will change the results much. Still, in close races like Measure K in Covelo, certain school board races, and for the last-place seat on the Fort Bragg and Ukiah city councils, enough votes remain untallied to change the outcome of those races. Additionally, there are a couple dozen votes that have not been counted because poll workers have deemed the signature on the ballot to not match with the signature on the voter registration rolls. In California, if these two signatures don't match the the voter is informed by mail and given the opportunity to prove that they are indeed the person who cast the ballot. The election's office is sending out notifications for the couple dozen voters in Mendocino County whose signatures didn't match, giving them a couple weeks to correct the issue before invalidating those ballots.